On her first day of school, Lily Struthers meets Eva, one of the daughters of the infamous avant-garde artist Evan Trentham. He and his wife are attempting to escape the stifling conservatism of 1930s Australia by inviting other like-minded artists to live and work with them at their family home. As Lily’s friendship with Eva grows, she becomes infatuated with this artist colony, longing to truly belong to this makeshift family. Emily Bitto’s debut novel has been inspired by aspects of the legacy of the renowned Heide group of artists and writers, which included controversial figures such as Sidney Nolan and John and Sunday Reed, whose private lives were as controversial as their creations. 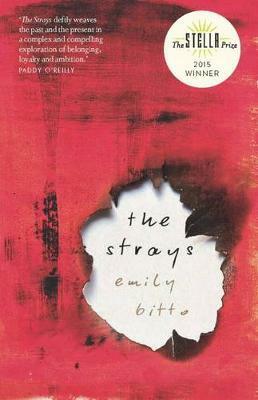 Emily Bitto’s debut novel, The Strays, is a compulsively readable story of the 1930s Australian art scene, parental narcissism and female friendship. The title refers to the community of artists whom Evan and Helena Trentham gather around themselves at their spacious and rambling home. The narrator, Lily, is one of these strays. At school, she bonds instantly with the Trenthams’ middle daughter, Eva, and they become inseparable. The Trenthams’ life offers Lily what she doesn’t have in her own home – she is the only child of conservative, reserved parents – and she loves the freedom, the parade of interesting people, and the sense of belonging, though tenuous, provided by Eva and her sisters, Beatrice and Heloise. Lily is an outsider and as such she is a wonderful narrator – embroiled but not too emotionally involved. She listens to the artists’ talk of radical politics and their criticism of the conservative Australian art scene. She is present at the dinner when Evan and Helena announce they are opening their house and studios for other artists to live and work in. This is something they haven’t consulted their daughters about, and is yet another indication that the adults’ needs come first. As Lily grows older, she begins to understand the effect this neglect has on the Trentham daughters. In one episode, Eva desperately wants to do something unique for her fourteenth birthday, which she shares with her father (and as Evan reminds her, three quarters of his name), but nothing separate is organised. And while Eva is at least able to put a voice to her resentment, it is Heloise, the youngest Trentham, who bears the brunt of the chaotic household – to devastating effect. The fallout that occurs is inevitable and the reader is waiting for it, yet Bitto still manages to surprise. I really enjoyed this book, particularly its portrayal of long-term female friendships, betrayal and forgiveness. Annie Condon is a bookseller at Readings Hawthorn and a convenor of Readings’ Contemporary Book Club.